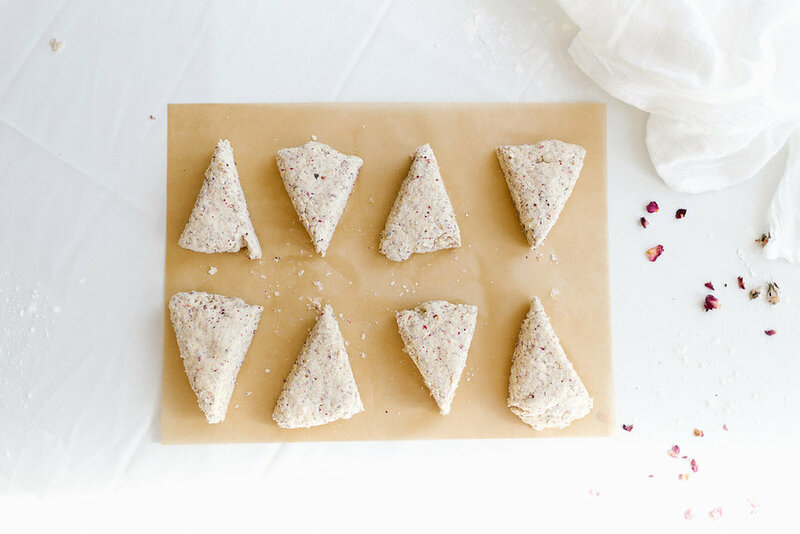 This scone recipe featuring rose and ginger provides the perfect balance and healing to your holiday gatherings or brunch anytime of the year! *If you can’t find dried rose petals easily, you could substitute 1 teaspoon of rosewater. Just wait to mix that in with the wet ingredients. Combine all the dry ingredients. I like to run mine through the sifter. You can also use a whisk to mix it all up and break up any chunks. Break out that food processor to cut the butter into the dry ingredients. (This is a real game changer for cutting butter and keeping it cold.) Cut your cold butter into chunks and toss it in the food processor with your dry ingredients. Pulse until you have a coarse crumb. Add in the buttermilk, egg and vanilla. Do a couple quick pulses until just combined and a dough is formed. Be careful not to overwork it during this step to keep those scones light and fluffy. Turn the dough out onto a clean surface - I love to use parchment paper. Use your hands or a rolling pin to form the dough into a circle about 1”-1 1/2” thick. Preheat your oven to 400 F while your scones chill out in the freezer. Pull your scones out of the freezer and brush the tops of the scones with buttermilk (I use heavy cream if I have it handy). You can sprinkle with some dried rose petals or turbinado sugar before popping them in the oven. Bake for about 20 minutes or until you have a nice golden color on top of the scones. *If you’re making these the night before, you can cover them and put them in the refrigerator at this point. When you wake up in the morning, simply follow the same instructions from this point on. My inspiration for flavor and herbal combinations really comes from everywhere. For the rose and ginger combination, I loved the fact that these two ingredients provide balance in one delicious treat with their distinct energies. I’ve also come to love rose in my personal self-care routines, because she truly does work wonders in opening and healing the heart. As with all magic and witchcraft, the most important part of any practice is YOU. Set your intentions before or when you get into your kitchen. Figure out what environmental aspects put you in the right mindset to infuse your cooking with your good vibes. I love to put a little music on, make sure my kitchen space is clean and clear, and take a minute or two to do some breathwork and center myself. I’ve found that it’s often the smallest things that make the most impact on healing through food. Coming as a huge surprise to no one, roses have long been used to help in love work including opening and healing the heart. She can be used to relieve stress and disturbances especially around the home, so pretty damn perfect to keep the hustle and bustle of the season and guests under control. A few of her other magical properties include protection, compassion for yourself and others, forgiveness, strength and stability. Great for indigestion and sure to help with any family or friends who give you agita. Another herb with a history of aiding in love as well as holding your intentions to the fire and giving them extra power. He’s also known to help with courage, power and balance. Not to mention his nice balancing act with the rose included in this recipe.